For a long time this was the single most important building and institution associated with Axminster. The history of Newenham will be a significant feature of the initial display in the Axminster Heritage Centre, and over the near future we will provide appropriate background information here. In the meanwhile, the key dates and events linked to Newenham can be found in the section of this website where the town’s Timeline is set out. Much more information can also be found in James Davidson’s ) 1843 book ‘The History of Newenham Abbey in the County of Devon’. Until the middle of the 19th century the town of Axminster did not extend much further than what would now be considered the town centre. 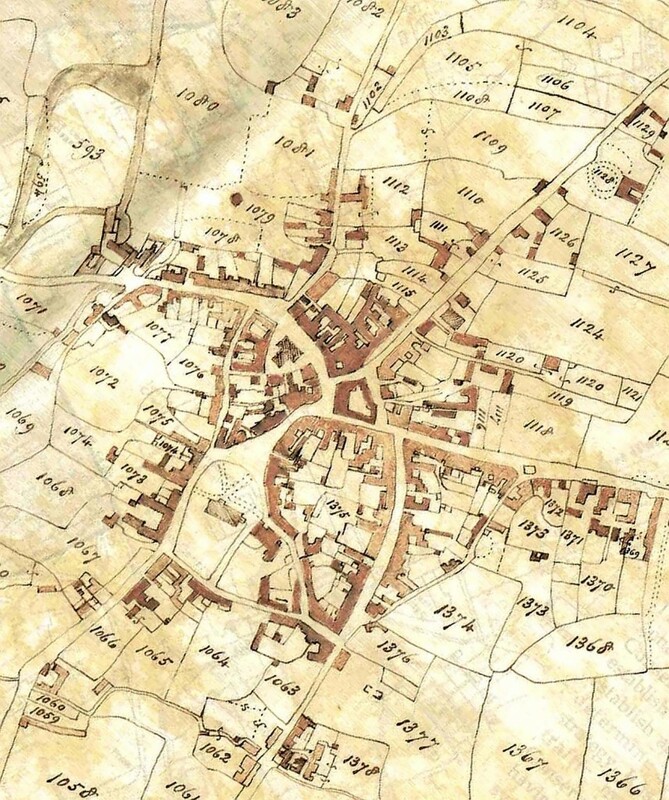 To that extent there had been little change for hundreds of years, as can be seen by comparing Angela Dudley’s drawing of the likely late Mediaeval plan of the town and the Tithe Apportionment map of 1838. What is striking is that when the town was burned down in 1644, during the Civil War, it was re-built very much as it had been before, rather than taking the opportunity to modernise the layout in any significant way. In this regard at least the citizens of Axminster responded very much as those of London did 20 or so years later after the Great Fire, when the need to re-build quickly took precedence over any consideration of ‘grand plans’. By 1838 the main thoroughfares, very like today, were Chard Street, Lyme Street, South Street, Silver Street, Church Street, West Street, Castle Street, Castle Hill and North Street. In the centre of the town was the newly-developed Trinity Square, leading to Victoria Place and Market Square. Chard Road, Lyme Road, Musbury Road and Willhayes were very much on the edge of town, as were Stoney Lane, Coombe Lane and Widepost Lane. Indeed the points at which Chard and Lyme Streets become Chard and Lyme Roads are very good indicators of the historic town limits. The plan of the current designated Conservation Area, which is provided below in connection with the prominent houses of the town, very much follows the same logic. The results of recent research into the expansion of the town, from the Victorian era to the present time, can be found here. Most (if not all) listed and otherwise notable buildings in the Conservation Area which are now dwellings, including those that have been demolished. Other larger / historic dwellings within the Town’s boundaries, whether listed or not. ‘Grand houses’ outside the town but still within the parish of Axminster. The guidelines for inclusion are the sort of houses where in Victorian times the owners would probably have had 2-3 house servants or more and a gardener (i.e. something a bit grander than a solid farmhouse that would sell for £1m today). The extent of the Conservation Area is shown below. The following text, which mainly covers the period up to 1939, is intended to provide a basic framework which can be expanded over time. Any further information which current or former residents of these houses may wish to offer will be very gratefully incorporated. Lt Col Charles Archibald Macalester JP lived from at least 1844 to 1850 at Adrienne Cottage. From at least 1866 to 1873 the occupier was De Ferrass Tempest. References after this point are to Adrienne House, with Robert England and his family being the occupiers from at least 1879 to 1893. From at least 1902 to 1906 the occupier was Thomas Alexander Young. There is then a gap in the record until 1923, when Mrs Percy-Hardman, whose husband had been killed in the First World War was the occupier. She remained there until at least 1939. The first reference to Brookhill is 1890, when John Overmass jr was the occupier. He remained there until at least 1914. No resident is then listed until 1926 when George Morrish was living there. He remained until at least 1939. In 1883 the newly built Brooklyn House was occupied by John George Pinney, an architect. He remained there until at least 1893, and was followed by Captain Atkinson Grimshaw RN (in 1902) and Rev Thomas Edward (in 1906). By 1910 Brooklyn belonged to Edwin Henry Dawkins, proprietor of Axminster’s largest shop, whose family remained there until at least 1926. In 1930 it was occupied by Rev J Spence Robertson, and in 1936 by his daughter. It is now the Kerrington House Hotel. Built in 1776 for Robert Hallett, a wealthy wine and spirit merchant who also owned a tape manufacturing business on North Street, and was a co-founder of the first bank established in Axminster. He died in 1825, and from at least the 1840s to the mid-1860s it was occupied by Major Nathaniel Tryon Still, and then by Captain John Tryon Still JP. In 1878 the house was occupied by George Barnes MD, who was still there in 1902. However, by this point the house appears to have been used by multiple doctors, possibly as an early surgery (this was before Axminster Cottage Hospital was established in its present location). The actual resident appears to have been Charles Henry Hallett, a surgeon, and he and his family were regularly listed as the occupiers of Castle House from at least 1890 to 1923. From at least 1930 to 1939 Sidney Owen Gill JP, owner of a bakery and café in Trinity Square, and an early shareholder in Axminster Carpets, was the owner of Castle Hill House. Castle Mount was built on the site of the former Dolphin Inn after it burned down in 1881. By 1883 James Bidwell (co-owner with his brother of one of the two brush factories at the foot of Castle Hill) had moved in, and lived there until at least 1890. From at least 1893 to 1919 Richard Southwood was the occupier. By 1926 Sidney Owen Gill had moved to Castle Mount, but he only lived there briefly. Robert Cornish JP was the owner of Cedar House from at least 1889 to 1935. In 1939 the house was converted into the hotel of the same name. It was subsequently (in about the 1970s) turned into a care home, and part of its garden was re-developed for additional housing. It now forms part of Silverleigh-Cedars. Built in the late 1860s, the first resident recorded was General McBean KB, in 1870. By 1878 George Andrew Spottiswoode JP had bought the house and land. He was the founder of Spottiswoode & Co, a London printing business (and brother of the co-owner of the publishers Eyre & Spottiswoode). He spent his retirement promoting his evangelical Christian views. He died in 1899, and was succeeded as owner by Mrs Stafford, who lived there with her daughters until at least 1926. By 1930 the new owner was Charles Henry Dent, whose family lived there until at least 1935. The house has subsequently been broken up into smaller units. Built in about 1832 for Edward Smith, a Quaker. In 1773 the house passed by marriage to William Kennaway. In 1824 it was bought (along with the Manor of Axminster) by James Alexander, a London solicitor, who laid out ‘the Lawn’. His widow Ann died there in 1846, and the house was then bought by Henry Knight jr, who was recorded as the occupier in 1856. He and his family lived at Cloakham until at least 1902, after which there is a gap in the records until the house, along with the Manor of Axminster passed to Charles Snell. He and his family lived there until at least 1939. It was subsequently bought by Harry Dutfield, the founder and part-owner of Axminster Carpets. The first resident recorded at Combefield House was Captain John James Martin RN in 1883. He remained there until at least 1893, and was succeeded by Dr George John Padbury MB, who lived there from at least 1902 to 1914. Charles Newbery lived there from at least 1919 to 1923, and was succeeded by J Arthur Chubb (from at least 1926 to 1939). There is plenty of scope for confusion between Combe House and The Combes, but it appears that from at least 1889 to 1914 Captain Edward Charles Forward JP and his family lived first at Combe House before moving to The Coombes. Before the Forward family moved there, and from at least 1893 to 1902, Henry John Bellamy Shuttleworth King lived at The Combes. From at least 1910 to 1919 Miss Elliott was listed as living at Combe House. Between 1919 and 1935 the only reference to either house is 1926 when Mrs Cross was living at Combe House. Then after a short gap Alfred Henry Bridgman lived at Combe House from at least 1935 to 1939, with Edward Wheaton also listed at The Coombes in 1939. The Elms was occupied for many years by William Forward and his family, starting in about 1878. They were still there in 1939. By 1836 John Charnter, Vice Chairman of the Axminster Poor Law Union and a churchwarden, was the occupier. In the 1840s Sir George Best Robinson, formerly HM Chief Superintendent of British Trade in China was living there (his wife died in 1843 during his residency). In 1850 S Northmore Esq was listed as the occupier, and on 20 May 1851 Thomas Northmore, a prominent geologist and discoverer of a cache of bones in Kent’s Cavern, Torquay died there. William Romains, who was briefly a curate at Axminster lived there in 1856/57. He was succeeded by Captain (later Rear Admiral) Frederick Lamport Barnard until his death in 1880. From at least 1883 until 1906 the resident was Captain Arthur Parry Rogers JP, formerly of the 68th Light Infantry. He was followed (in 1910 and 1914) by Colonel Arden Lowndes Bayley, but after that point residents are not listed. The house was eventually bought by Axminster Carpets, and demolished to create additional space for their expanding works. Furzeleigh House has been in existence for a long time. It was originally associated with farming, but in more recent times was turned into a desirable residence. By 1844 it was the home of Samuel Stevens, and in 1856 of John C Stevens. In 1866 Urban Rider was the resident, followed by G F Davis in 1873 and William Yates Caister in 1878. In 1883 the resident was Alexander John Knight. In 1902 and 1906, after a gap of about 20 years in the record, Rev James Richard Woodgates MD was the resident, followed by Reginald Aloysius Talbot (at least 1910 to 1914). Next came Gordon Kearsley Hart, who lived there from at least 1919 to 1939. The first record of Gamberlake is in 1919, when Colonel Arden Lowndes Bayley moved the short distance from Furzebrook House (see above). He remained at Gamberlake until at least 1939. The first resident listed at Gloucester House was Thomas Lucas in 1914. After a gap in the record of several years it was occupied from at least 1935 to 1939 by Alfred Snell. Great Trill, and old and impressive manor house set in its own large farm near the boundary with Musbury parish belonged to the Drake family of Ashe House, Musbury until 1782, when it was bought by Rev George Tucker, and then John Gregson of London, who also owned Little Trill (in Musbury parish). It is unlikely that either of these last two owners ever lived there, and the house was frequently used as the accommodation for the farm manager (bailiff) (e.g. Joseph Gage and his family from at least 1838 to his widow’s death in 1855). In 1860 Great Trill was sold to Messrs W&J Sparkes of Crewkerne and Joseph Gage’s son John remained as the tenant until his death in 1868. John Salter lived there as the farmer from at least 1869 to 1879. For a few years in the 1890s (and certainly in 1893) it was occupied by its then owner, John Francis Sparkes. By 1901 Eli Collier was the farmer at Great Trill, living in the main house, and he was followed by his son of the same name. By 1919 William John Major was the farmer and resident at Great Trill, and he remained until his death in 1940. Gilbert Francis Morris took over at Great Trill and was living there in 1943. Heyop House (next to the Axminster Heritage Centre) was originally built in about 1830 for Thomas Rapson Whitty (grandson of the founder of the original carpet factory). There is then a long gap in the records until 1878, when Mrs Reece and the Misses Reece were the occupiers. They ran a school for young ladies there until at least 1906, and by 1910 John Neville Blithe Vise had succeeded them. By 1914 Dr William Charles Mence, who had just moved to Axminster to work at the new Hospital was the occupier. His family lived there at least until his death in 1919 (as a consequence of his service in the First World War). By 1923 Cecil Forward, a local solicitor, was the occupier. He may well be the person who converted Heyop House into its present incarnation as Law Chambers. Built in 1761 for Amos Callard, an attorney and Steward of the Petre estate. He sold it in 1763 to John Knight, another attorney, and Callard’s successor as Steward to the Petre estate. John Knight added a chapel, brought a Catholic priest to live with him and his family, and provided a place of worship for Axminster’s Catholic community. He died in 1801, but this arrangement lasted until 1831 when the Catholic Church of Lyme Road (almost entirely paid for by the Knight family) was opened. John Knight’s widow Sarah lived at Hilary House until at least 1850, and in 1861 it was apparently demolished and re-built. It was then the home of Captain (later Vice Admiral) John Williams Aldridge RN from at least 1866 to 1873. He was succeeded by another retired naval officer, Captain Charles Joseph Wrey RN JP from at least 1878 to 1883. After a gap in the records Hilary House was occupied by William Henry Barns Knight and his family from at least 1902 to 1939. The house was later demolished, and replaced by several houses and bungalows. Built in 1825 for Rawlin Mallack, a local attorney. He subsequently let all or part of the house to Arthur Henry Dyke Acland (from a leading Devon family: he was active in local affairs until he moved to Dorchester), and then to the widow of Lt Col Sevan. By 1857 Rawlin Mallack’s widow was living in Hill House, and Captain Thomas Mallack was in the nearby Hill Cottage. In about 1860 some major work was done, and the house now known as Old Park was created. See below for more on Old Park. There are only occasional references to Ivy House. In 1914 the occupier was Avereld Redwood, and in 1919 it was John Patterson, an Axminster butcher. In 1939 Mrs A Gill was listed as the occupier. It is not known when Lea Combe House was built, but by 1844 it was the home of William Aggett Richards. By 1850 he had given way to J H Richards, probably a relative. By 1856 the new resident was Jeremy George, a barrister, who lived there until his death in 1874. By 1883 the resident was Richard Brymer Martin, who remained until at least 1890. In 1893 the resident was James Coate, who owned a brush factory at the foot of Castle Hill, and he lived there until at least 1906. From at least 1910 to 1935 the occupier was Major Alexander Collingwood Fownes Luttrell. In 1939 the occupier was Joseph Sherwood Clarke. It is believed that the house was hit by an incendiary bomb during the Second World War. The first recorded resident of The Lawn was James Alexander Knight JP, whose family lived there from at least 1866 to 1883. From at least 1890 to 1893 the occupier was William Patrick, followed in 1902 by Dr William Langran LRCP, who remained there until at least 1930. He acted as Medical Officer of Health to Axminster Urban District Council. The house was demolished soon after he left, and was replaced by the Guildhall, which stands there still. The first clear reference to Loupe House (generally spelled with an e) was in 1873 when Henry Raymond was the resident. However, from at least 1856 to 1866 Lt Col Charles Archibald Macalester JP had been listed at Loupe Cottage, which might be a reference to the same house, given that no residents were recorded at Loupe House over that period. In 1878 the occupier of Loupe House was Thomas Owen Preston Cook, but by 1889 Mrs Kate Haydon had moved there. She remained until at least 1893, and was succeeded by Miss Horn from at least 1902 to 1906. After a short gap, Herbert G Horn was recorded as the resident of Loupe House from at least 1914 to 1930. The first occasion on which a resident was recorded at Lyme House was 1870, when Thomas H B Venour was the resident. The next occasion was 1883, when Robert Henley, a stone mason, was there, though he had lived on Lyme Road for some time by then, quite probably at Lyme House. He and his family lived there until at least 1910. He was succeeded by George David Lansley JP, who lived there from at least 1926 to 1935 (and as early as 1914 was recorded living on Lyme Road, probably in Lyme House). The first mention found for Mount House is 1889, when Benjamin Thorn was the resident. He and his family remained there until at least 1893. In 1902 Richard Venner was the occupier. From at least 1910 until 1919 Arthur Bidwell and his family lived there, followed by James Byron Attfield from at least 1923 to 1939. The first reference to New Park as a private residence (as opposed to a farmhouse) is in 1914 when William B Leach was the occupier. He remained until at least 1926, and he was succeeded by Colonel Thomas Townley Macan CB (in 1930) and Major General Charles Richard Newman CB CMG DSO from at least 1935 to 1939. Built in 1758 for Simon Bunter, a local attorney, Oak House was described by Pevsner as the best house in Axminster, and is Grade II* listed. Bunter left Axminster for Lyme Regis, where in 1774 he had Belmont House built. At some point Oak House became a school (which it still was in 1878). It was later used by Edwin Dawkins’ drapery business to house their unmarried staff. In 1906 and 1910 Thomas Ramsay MA was shown as the resident. He was followed by Rev Albert Louis Panchard in 1914. Soon after that, and until 1931, Oak House was used as the offices of the Axminster Urban and Rural District Councils. It is now a care home. Located immediately next to Oak House (see above), Oak View was occupied from at least 1910 to 1939 by Samuel Gilbert Nicholls. See above under Hill House for the origins of Old Park House (the farm of the same name has much older origins). By 1866 Old Park was the home of Dame Emma Louisa Tulloch, widow of Angus Tulloch of Manchester. She gave the land and funds to allow both Woodbury school and chapel to be built, and she remained at Old Park until her death in 1903. Her sister inherited the house, but rented it briefly to Henry Lennox Warburton (who was there in 1906). She sold Old Park in 1910 to Malcolm Couper Gibb JP, and he and his wife lived there until at least 1939. Poplar Mount was occupied by a local surgeon, Charles Hallett MRCS, from at least 1866 to 1883. There is then a long gap in the record until 1910, when it was occupied by John Copp, who remained there until at least 1919. In 1878 Edgar Bartley was the resident of Prospect House, probably recently constructed. By 1883 it had been acquired by the Bidwell family (Arthur Bidwell was co-owner with his brother of one of the two brush factories at the foot of Castle Hill, and he lived there until at least 1906). However, in 1906 it was also listed as the home of William Henry Percy-Hardman, who had a business manufacturing drinks. After he was killed in the First World War his widow and children remained there until at least 1919. They were succeeded by Captain William J W Kerr (from at least 1923 to 1926), but that is the last listing that has been found. Bought as a cottage by James Davidson in 1820, along with the surrounding parkland and farm. He converted and extended the house over the next few years. After his death in 1864 the house remained home to his widow and daughters until at least 1883. By 1889 it was occupied by John Kircaldy Cunningham and his family. His daughters remained there until at least 1939. The Shrubbery may well have got its name from the nursery business conducted from approximately that location by Joel Hill (reported in the 1820s to hold a stock of up to 1 million trees). The first reference to The Shrubbery is in 1870 when Henry James Ellery MD was the resident. He was still there in 1873, but by 1883 Edwin Chapple was the occupier. He and his son, William Edwin Pitfield Chapple, lived there until at least 1926. In 1866 the resident of Symonds Down House was John C Stevens. He was followed (by 1870) by Mr J Lovegrove. By 1883 it was owned by John Cann jr JP and his family, who remained there for at least a decade. The house then passed to Mrs Briscoe, who lived there from at least 1902 until 1914. Lt Col E Trevor Wright was the resident in 1919, followed by William Clement from at least 1923 to 1926. After that it became the home of Francis Cave Snell (from at least 1930 to 1939. Subsequently the house was converted into an hotel, before being returned to residential use again. Built in about 1710 for Henry Knight, an attorney and Steward to the Petre Estate. His family was still living at Terrace Lodge in 1889, when William Henry Barnes Knight was the owner. There are gaps in the record, but in 1910 Alexander John Henry Knight was living there. In 1914 the resident was Piers Tempest, followed in 1923 by Mrs Talbot. From at least 1926 to 1935 it was the home of Allen Lepard Crockford. The name was later changed to ‘Pippins’, and after being used for some years as a school, it now acts as a youth centre. Although a very old property, no ‘private resident’ (as opposed to, say, a working farmer) is recorded living there until 1914, when Cyril Holmes was the resident. He left soon thereafter, and was killed in the First World War. He was succeeded by Lt Cmdr Hugh H Paynter in 1919 and John Vigers Worthington in 1923 and 1926. Captain Robert Edward Stanley Pearce was the occupier in 1930, followed by Captain Henry A Cartwright MC in 1935. The first reference to Wykeleigh House is in 1910, when Ernest Hoel Hacon was the occupier. He had been Superintendent of the Devon Constabulary until 1907, and subsequently served as a Major during the First World War. He was succeeded at Wykeleigh House by Captain John William Roche (in 1919) and then by retired Commander Odiarne Unett Coates RN from at least 1923 to 1939. Axminster is not only a market town with a very long history in its own right; it is both a civil parish and an ecclesiastical one (the two entities now cover largely, but not precisely, the same geographical area, but the boundaries have frequently been changed over time). From the time of its founding, its strategic location was based on two geographical ‘facts on the ground’: the town overlooks the confluence of the Axe and the Yarty rivers, some 5 miles from the sea; and it sat at the junction of the ancient ‘Portway’ trade route and the Roman Fosse Way. 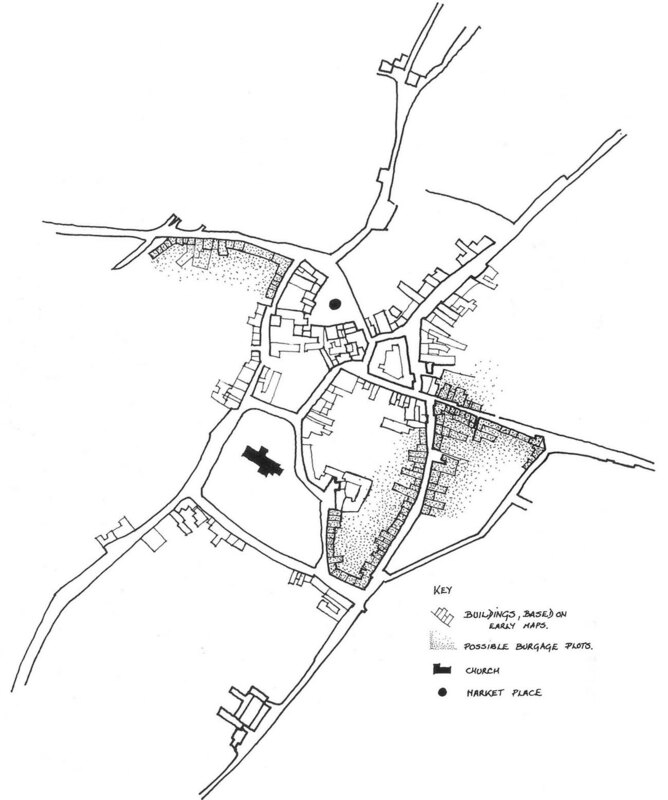 As the population density grew, these facts made it a natural focus for surrounding settlements, and in 1204 King John granted the Lord of the Manor the right to hold regular markets at Axminster. The question then arises: how far does this ‘natural hinterland’ spread? Before considering that question further, here is a map of the area from over 50 years ago (Bartholomew’s Road Atlas of Great Britain 13th Edition, 1960). As can be seen, this map pre-dates all of the local by-passes, and the re-numbering of the main roads. Parishes form important building blocks in any consideration of a town’s history and significance. In the era since written records started to become both widespread and necessary (particularly since the 1550s when records of births, marriages and deaths were required by law to be kept) every parish had (at least in theory) a resident educated man in the form of the local priest, and a defined set of boundaries which could form the basis for the raising of taxes and the administration of the law. Furthermore, no land was allowed to slip between the boundaries of parishes, except in very remote areas with few if any residents. If tax was collected from all parishes, the King knew that he was spreading his net over the whole country. Lords of the Manor also had their roles to play, and great influence over what was actually done locally, but the footprint of their landholdings seldom coincided with parish boundaries. This situation had developed over time. The records of lawsuits from the 14th to mid-16th centuries which are held in the National Archives show that references to places are increasingly references to parishes as we would understand them. Much earlier than this, when churches and chapels were fewer and further between, documents such as the Domesday Book (of 1086) focus on settlements, without reference to parishes per se. For an excellent overview of a parish-based approach to the history of Devon, look no further than the Genuki.org.uk website. For Dorset parishes, a good starting point in the opcdorset.org website. For a wonderful and accessible account of what is recorded in the Domesday Book, go to the Opendomesday.org website. The parish of Axminster includes parts of Smallridge, and outlying hamlets (or groups of farms) at Westwater, Weycroft and Wyke. The rest of Smallridge, together with All Saints, Churchill and Alston, are in the parish of Chardstock. Furley is a hamlet within Membury parish, and Whitford and Hampton both fall within Shute parish. Maindenhayne is part of Musbury, and Yawl is in Uplyme parish. For centuries Beer and Seaton formed a single parish, with Beer being the larger of the two settlements. From Saxon times parishes were grouped together into ‘Hundreds’. This is not the place to discuss the origins or details of the term; suffice it to say that they were created to give a group of parishes a single place where they could look for some sort of justice, and as the population grew, so some of the Hundreds were split up. Axminster was the focus of a Hundred from the start, but whereas the earliest manifestations covered large swathes of East Devon, in due course new Hundreds were created centred on Colyton and Ottery St Mary (uniquely in Devon, a single-parish Hundred, reflecting Ottery’s importance and wealth). By the middle of the 19th century, when the practical significance of Hundreds was in steep decline, Axminster Hundred wrapped around Colyton, taking in Honiton at the western end and the slopes of the Blackdown Hills in between. Axminster has always been part of Devon, but several nearby parishes have been the subject of boundary adjustments since the 1840s. At that time Stockland was an ‘island’ parish which belonged to Dorset, but was surrounded by Devon parishes. Until 1842 Dalwood was a chapelry within the parish of Stockland (and therefore also part of Dorset in ecclesiastical and administrative terms), but in 1842 it became a parish in its own right. Likewise Thorncombe was a Devon ‘island’ parish within Dorset. Both Chardstock (including All Saints) and Hawkchurch also formed part of Dorset at that time, but unlike Stockland they were not surrounded by Devon lands. In 1844 Stockland and Dalwood were transferred to Devon, and Thorncombe was transferred to Dorset. It was not until 1896 that Chardstock and Hawkchurch were transferred from Dorset to Devon. On 1 July 1837 Axminster became a Registration District for births, marriages and deaths, covering an area which went as far as Beer in the west. The ‘next district over’ was centred on Honiton, with Yarcombe falling into the Chard district. 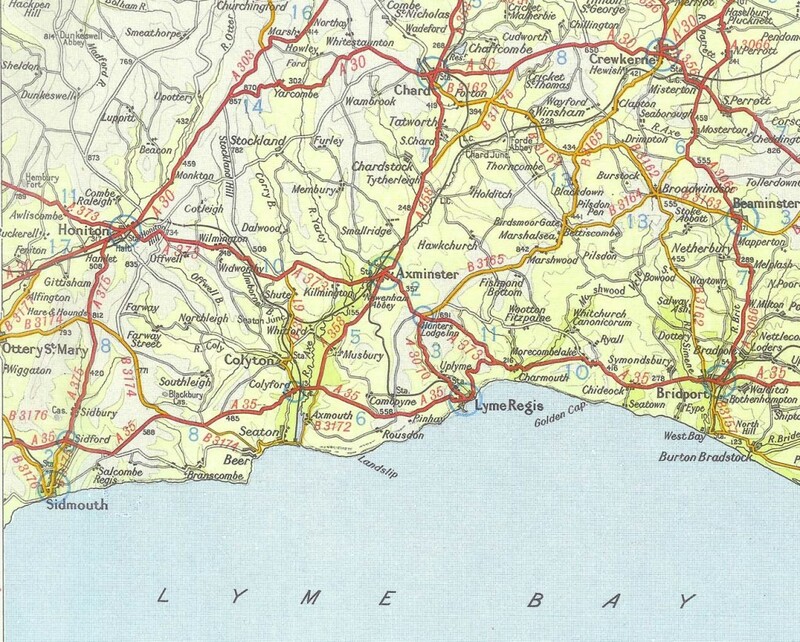 As the parishes identified above moved into Devon they were transferred to the Axminster Registration District. These arrangements survived until 1930, when the much larger Honiton district was created, and Axminster was amalgamated into that. Parishes were also organised into ‘Deaneries’ by the Church of England. 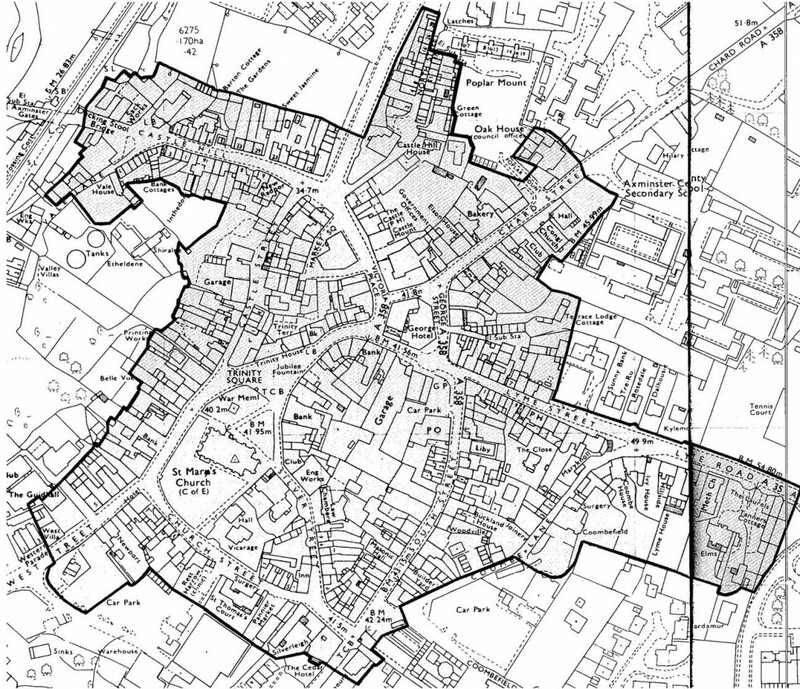 Like the Hundreds, Deanery boundaries were subject to periodic review and adjustment, but for a significant period Axminster formed part of the Honiton Deanery, which when combined with parts of some smaller adjacent Deaneries, was comparable in size and composition to the post-1930 Honiton Registration District (see above). At one time Axminster had both an Urban District Council and a Rural District Council, which covered the outlying parts of Axminster parish, plus several adjacent and nearby Devon parishes. In 1939 the 14 other parishes covered were: Axmouth, Beer (including Seaton), Chardstock (including All Saints), Colyton, Combpyne, Dalwood, Hawkchurch, Kilmington, Membury, Musbury, Rousdon, Shute, Stockland and Uplyme. When the County Court sat at Axminster, the court’s remit covered Axminster itself plus the 14 parishes named immediately above, plus five Dorset parishes: Catherston Leweston, Charmouth, Lyme Regis, Thorncombe and Wootton Fitzpaine. NW corner: to the NW of Stockland village. NE corner: near Forde Abbey. SE corner: in Lyme Bay, to the south of Charmouth. This represents an area measuring about 16km (or 10 miles) from south to north (from Beer to Stockland), and about 13km (or 8 miles) from west to east (from Stockland to Forde Abbey), and is shown on the following section of the map reproduced above, at the start of this section. Lie physically adjacent to Axminster parish (ignoring the ancient Axminster tithings of Beerhall and Shapwick). Were included within the historic ‘Hundred’ of Axminster. 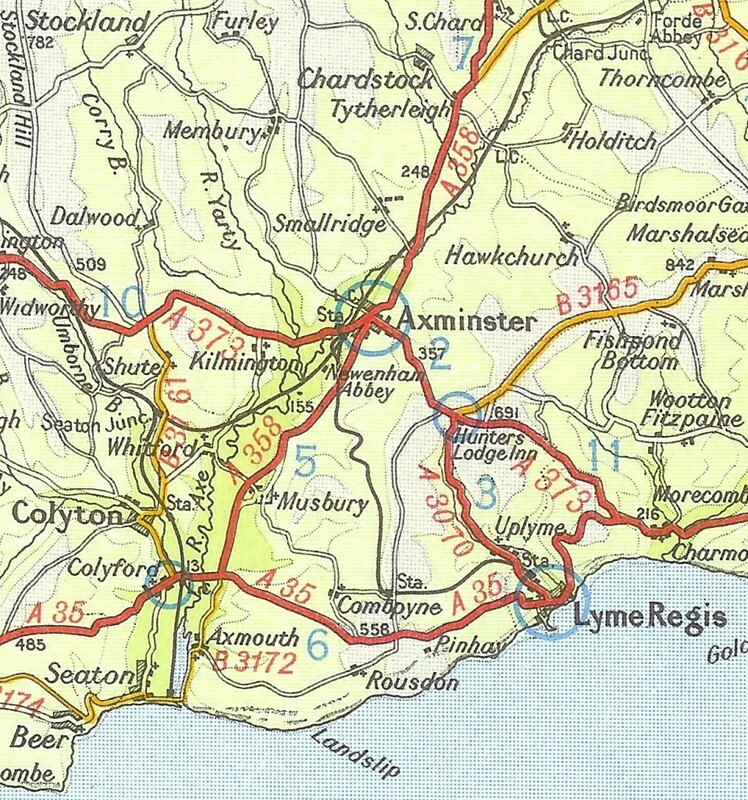 Were included within the Registration District centred on Axminster, as defined in 1837. Parishes Adjacent to Axminster? Axminster Hundred? Axminster Reg. District? Note 1 Chardstock parish used to include All Saints, and All Saints is adjacent to Axminster. Chardstock has a local history website which also covers All Saints. As set out above, all of these parishes were covered by the Axminster Division of the County Court in 1939, and all of the Devon parishes were also at that time in the area administered by Axminster Rural District Council. The only parish in either of these administrative sets not listed in the table above is Catherston Leweston, a very small parish to the north east of Charmouth. These parishes can therefore quite reasonably be considered to constitute Axminster’s wider natural hinterland, with the links being looser the further one travels from Axminster itself. Taking into account the way that neighbouring towns have developed, as well as the historical ties outlined above, the parishes which are unequivocally linked to Axminster are Kilmington, Membury and Musbury, closely followed by Hawkchurch, All Saints, Chardstock, Stockland, Dalwood, Shute, Axmouth, Combpyne, Rousdon and Uplyme, not forgetting Wootton Fitzpaine just over the county boundary. Links to the most relevant parish websites are provided on the Links page of this website.